s it wrong to want to help? There's that phrase: I was only trying to help! Thing is, when people are "only trying to help," it's usually unsolicited. And maybe that's the problem. But it seems like a dangerous road to walk down, because when you offer help only to those who ask, then all the timorous grannies of the world will stand on the corner  frightened to cross the street  for the rest of their days. And kittens will forever end up in trees. See, kittens can't speak, so they can't ask for help. For one reason or the other, Aural Report is often in the position of championing the underdog, reviewing those acts that few know about, that few see. Helping out, I suppose. After all, which musician couldn't benefit from some free publicity? But maybe they don't need help; I don't know. 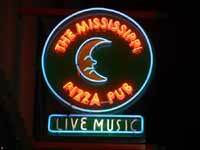 Mississippi Pizza: live music seven nights a week in North Portland. The Gypsy Jazz Trio look a little light as I saunter into the music room at the Mississippi Pizza Pub  a great place to enjoy acoustic music with your two buddies, pizza and beer. The Gypsy Jazz Trio, though, consists tonight of just two buddies with guitars struggling with the P.A. system. We later learn that the bass player is ill. Sitting under unique cloth and ceramic relief sculptures, I'm charmed by the trio; they struggle with broken strings, spill their wine and, for the most part, play in front of seven people. But play they do, working up sweats though sitting almost stock-still in their chairs. Dang it, they deserve this review! They need to sit down with me over a pint and answer some questions, because I'm curious and I want the world to understand. Gypsy music: as the trio does it, brisk bouncing rhythms in old-world harmonies with ebullient melodies burbling over the top. I wonder if often-frenzied gypsy music moved through Acadia into what we now call bluegrass music? 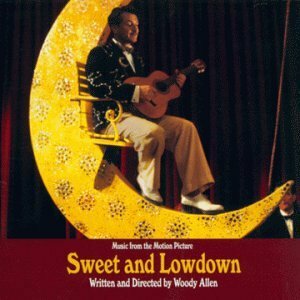 Woody in mind: "Sweet and Lowdown," Allen's 1999 gypsy-jazz movie. The faster it gets the trio certainly should sweat; the faster it gets I grin, my eye twitches. For some folks it may bring to mind the Woody Allen movie, "Sweet and Lowdown." For most folks it may bring to mind nothing. I want to know why one would choose this type of music. Clearly there's no money in something that obviously takes a lot of effort. Do the guys have other bands, to make it "pencil out"? I want to know how one person fell into playing rhythm and the other lead. My theory is that the rhythm guy is the nuts and bolts, day-to-day guy, while the other is the "big picture" dude. The former, practical; the latter, fiery. One keeps the business going, the other inspires it. My eye starts twitching during a nice, brief coda of harmonic grace notes. I wonder if these types write their own tunes, or if they play only standards. I know some of the requests offered by their musician friend in the audience and recognize the tune "All Of Me." But it seems like a good question, because wouldn't it be cool if there were young kids bringing this tradition into the future? They're just questions, after all. At the end of their hour-and-a-half set, I'd love just five minutes to throw out these few queries. I ask rhythm-guy Jon Thor Williams if he has a few minutes to answer some quick questions. Five minutes? Two? A minute and a half? Well, his girlfriend is waiting and he has to take four seconds to lift his guitar case off the stage. As a former rock bassist, I'm severely envious of a break-down agenda that negligible. 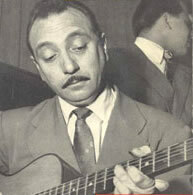 Django Reinhardt: the original jazz gypsy died in 1953. I do find out that Jon follows his path because he likes klezmer and Romanian music, that the trio is playing Tuesday nights from 5:30 (read: 6:00) to 7:30 p.m. at Mississippi Pizza for at least the next few weeks, that they may be switching to Fridays. I also learn quickly that they've been playing indoors for just a few weeks as they've been cutting their teeth busking on the streets of Portland. I suppose I could press my point and wait for the girlfriends to be tended to, the guitar cases to be set in the corner. But I'm working nine-and-a-half-hour days lately; I don't think five minutes are too much to ask for. Regardless, the Gypsy Jazz Trio is worth a look and I really do recommend you check them out. After all, I'm only trying to help.